The Hibs boss felt a draw would have been a fairer result. 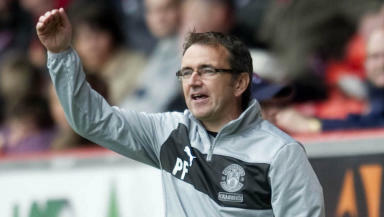 Hibernian manager Pat Fenlon says he views his side’s 2-1 defeat to Aberdeen as a missed opportunity. Eoin Doyle had equalised after Niall McGinn had given the Dons the lead but Gavin Rae’s strike ensured the Easter Road men travelled back to the capital empty handed. Fenlon said: "We actually started brilliantly and had a corner in the first minute before we gave away a sloppy goal. We are disappointed with the goals we conceded. There was not much in the game and I think a draw might have been the fairer result." The Hibs boss also lavished praise on Doyle for his superb equaliser as well as the partnership he is forging with Leigh Griffiths. He added: "He is playing with real confidence at the moment. Leigh is probably taking a lot of the credit but Eoin's work-rate has been fantastic and he is chipping in with goals now, which is a real plus. They look a handful together and a decent partnership."